We were thrilled that Jetstar CEO Dean Salter announced a few weeks ago that we have reached record numbers of passengers on flights this year – in fact 250,000 more than two years ago. Can you believe that in November we celebrated 700 weeks since Jetstar began flights out of Avalon! The first three months of the year flew by in preparation for the Australian International Airshow held here biannually. This year saw one of the biggest crowds ever – over 210,000 people. The extraordinary turnout was matched by extraordinary weather. Almost every day began under serene blue sky - conditions were perfect for flying and watching. In February SkyBus launched their route between Southern Cross Station and Avalon via Werribee, and the numbers are through the roof. It has made travelling from the airport to the CBD simple and comfortable, and we’re pleased that so many passengers are enjoying the free wifi, the family deals and the ease of travel. In July SkyBus joined with Geelong Taxi Network to provide a new service between Geelong, the Bellarine and the Surf Coast and Avalon. The improved service is much faster, with passengers having the option to travel direct from Geelong Station or to travel from their home to Avalon Airport. 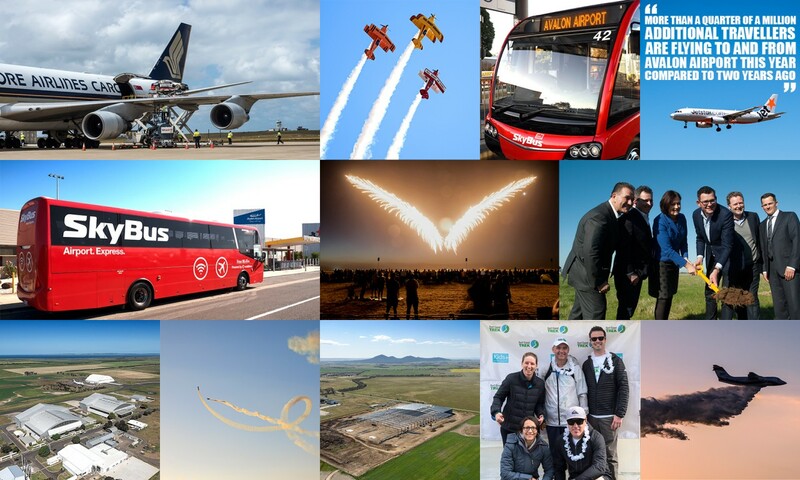 We’ve enjoyed working with SkyBus immensely this year. A major project for Avalon Airport in 2017 has been our first build in our Industrial Precinct. We began construction on the Cotton On Group DC in June. The precinct has been made possible by the State Government and Linfox and comes close on the heels of the Masterplan approval by the Commonwealth Government. The distribution centre is expected to be complete mid 2018. Some of the state’s fire fighting fleet are back with us this summer. They do a magnificent job at keeping our state safe, but we sincerely hope that this season they’re able to relax, unwind, put their feet up. Thank you to all our supporters, partners, tenants, colleagues and everyone who has flown into or out of Avalon this year. Remember flights are full, so if you need to fly, make sure you book early! Have a great Christmas, a fantastic New Year, stay safe, and we look forward to seeing you all again in 2018. So… where is Avalon Airport?